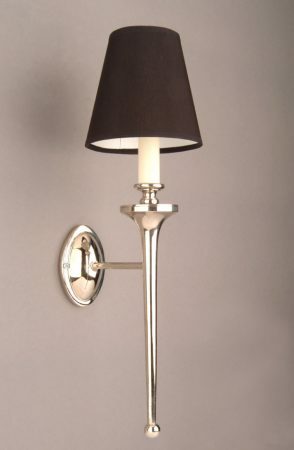 This Grosvenor nickel plated solid brass Edwardian style single wall light is beautiful and handmade in Britain. Featuring a detailed cameo wall mount, elegant tapered torchère light arm, with candle tube and tapered white lined black shade. Available with an alternative shade or without if desired, please contact us if you have alternative requirements. Made from solid brass and then plated with nickel and polished to a mirror finish. This lovely replica wall light just needs a wipe over with a damp cloth from time to time to maintain its lovely finish. From our handmade replica nickel plated Edwardian wall light selection. Timeless replica lighting made to last a lifetime. Handmade in the UK and finished to order. Each vintage wall light is handmade making every one unique. As these are made to order, please allow 4 – 6 weeks for your delivery. Hi Annie, many thanks for your question. As long as the light is fitted outside of zone 1 and zone 2 it is suitable to use. Please see link which explains the bathroom lighting zones. If they are to be used within zone 2 I can have them made with an IP44 rating at a cost of £412.75 each. Kindest Regards, John.